→Review of Empowered Mind Videos-What Change Would These Visualization Tools Make? Review of Empowered Mind Videos-What Change Would These Visualization Tools Make? As I have discussed many times here, affirmations are so powerful in helping us to change the programs and beliefs in our subconscious mind in order to attract the life that we wish to live. Writing affirmations more than a hundred times each day or saying them repeatedly could be a little hard to follow. One another way to plant these positive suggestions in our subconscious mind is to use subliminal messages. 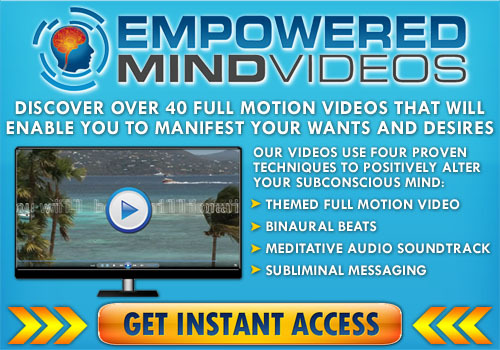 Empowered Mind Videos are prepared by using these subliminal messages, these high quality videos will help you to develop the perfect mindset to attract the things that you desire in your life. These videos are law of attraction based visualization tools that will help you to alter your old thinking patterns with the help of subliminal messages, meditative soundtrack, binaural beats and specific visuals prepared for manifestation purposes in all areas of life. Subliminal messages are suggestions that are used in a hypnotic way to reach a person’s subconscious mind. These messages are flashed at high speeds when our conscious mind is busy doing some other task and this is how it enters our subconscious mind more readily than simple affirmations as our mind is in slight hypnotic stage at that time. Binaural beats are sound waves that help a person to reach the alpha state of mind (in this stage,mind is highly receptive to positive suggestions) and the meditative soundtrack is simply the soothing background music that would relax you. You will get access to these powerful subliminal manifestation videos which are formulated especially in order to help you to improve in all the areas of your life by implanting powerful new suggestions in your subconscious mind. They have a vast library containing a lot of such videos; the collection includes videos for wealth, health, relationship, confidence, inner peace and lot more. I find it a very good idea to bring subliminal messages, binaural beats, and manifestation videos for visualization all together to change old programs of a person’s subconscious mind. Actually, it’s all the same process; you have to change the beliefs in one’s subconscious mind to help him attract his desired life and whether you use visualization, affirmation or any other method, there is only one goal-paradigm shift (altering of the old mind programming). Using these videos will surely will boost up the process, but one would have to dedicate his time regularly to see some significant results without aiming for any shortcut because subliminal messages do reach the subconscious mind, but to alter the old paradigms, repetition is essential. One of the main benefits I can see here is that the videos can help a person to visualize the life he actually desires. Commonly, after a person gets to know about the benefits of visualization he tries hard to visualize a different and better life than the current one, but it is difficult for him to bring those images in his mind as he has no proper idea of how the “better life” actually looks like as his mind is preoccupied with images of his current reality. Overall, I think empowered mind videos could really be a very beneficial tool for anybody who believes in the law of attraction.